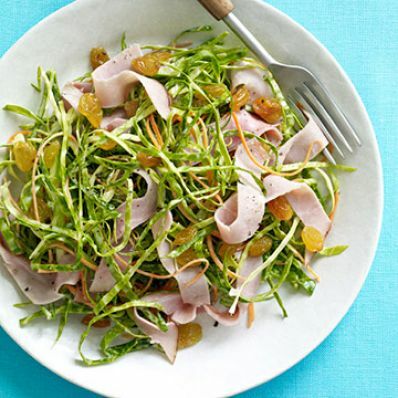 1 of 2 In a large bowl, combine green cabbage, shredded carrots, golden raisins and thinly sliced deli ham cut into thin strips. 2 of 2 In small bowl, whisk together creamy poppyseed dressing, reduced-fat sour cream, salt and pepper. Pour over cabbage mixture; toss to combine. Refrigerate at least 1/2 hour.